When Did Phoenixville’s Renaissance Begin? Last week’s guest post by Shannon Mannon of Activate Phoenixville Area (APA) proved to be very popular. In fact, it’s my most viewed post to date. That is understandable, because Shannon’s love for and commitment to Phoenixville shone clearly. 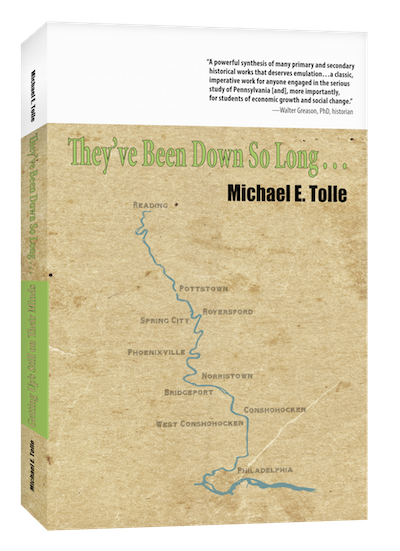 Her essay was truly a “love letter.” Shannon’s essay offered several threads to pursue, but as a historian, I have to start with one that is critical to addressing the question “why Phoenixville?”: when did the borough’s renaissance begin? “When did [insert your subject here] begin?” is one of the most debated questions in historical inquiry. The result is always disagreement as to the “correct” answer. There is no consensus definition of “began,” either, even when you have major events and convenient dates. The Japanese bombed Pearl Harbor on December 7, 1941, and we went to war. Okay, but that war had begun in 1939 when Germany invaded Poland, right? Yes, but the Japanese invaded China several years before that, and it was the Japanese who got us into the war, so shouldn’t their invasion of China count? And what about Germany and Italy making sure Spain would be at least neutral during the same period? If this is the way it is with such easily definable—and infinitely discussed—events, what about those of less fame and considerably less analysis? 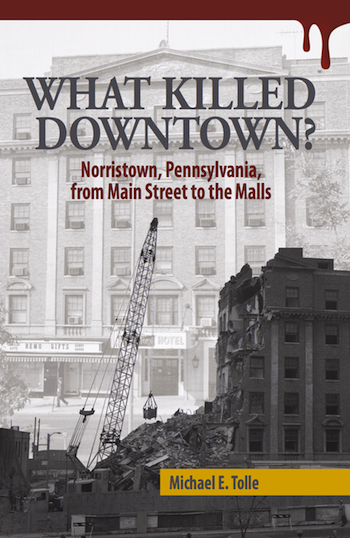 I deal with the question of when something “began” in my first book, What Killed Downtown? Norristown, Pennsylvania, From Main Street to the Malls. When did Norristown’s classic American Main Street downtown begin to decline? Here’s a hint: sooner than you think! I can back up my claim with statistics, but how about when the decline ended? No so easy, but I think I make a good case. Still, other—and conflicting—cases could be made. This is largely because life—and therefore time—is a continuum, a heterogeneous unity where every part differs from every other part, but in such subtle gradations that no boundaries exist within the unity itself. The corollary is that ALL such boundaries are both arbitrary and imaginary. Yet without boundaries and categories, all you would have is “hippie history,” where “everything’s like everything, man.” That would be no help to anyone at all. So we establish all sorts of groupings of reality’s elements, because we need to. We talk about them, promote them, disagree over them, but in the final analysis we should understand that they are all imaginary while we continue to employ them. Unfortunately, there are few concepts harder to keep in mind. I offer our current political discourse as an example. Historians, as you might expect, tend to give the “roots” of an event much attention. You must look at the period before it became obvious that something was going on if you want to know why it is going on. The result within our profession is that not only do we dispute the time when something “began,” we also dispute what ”began” actually means. As a result, that arbitrary and imaginary date when something “began” gets pushed back further and further. As we collectively understand history better, we appreciate the minute but inexorable pace of “change.” Pretty much everyone else settles for easily definable “periods” with exact dates for boundaries. The terms of presidents has pretty much replaced the reigns of kings for such purposes, but the change in very few of either actually signifies much. Here’s a question: might those “founding parents” who endured the hard times have a different idea as to what constitutes the beginning of “revival” than someone who had recently arrived? They have a very different perspective, after all. I suspect they might they date its beginning before 2003, but I am sure they could not all agree on any one year. Let’s return to the question of perspective. Even after statistical analysis had identified the date (range) when categories turned positive, wouldn’t something like “when Phoenixville’s renaissance began” ultimately be determined by your perspective anyway? If we consider statistics as results, or at least only a partial answer, then we need to identify those less quantifiable but still necessary other components. Either way, you have a chance to add important, but too easily ignored, pieces to the puzzle. I guarantee you that I will read what you send me, and perhaps even publish it, in part or in whole. Let me know what you think! This week I return to the topic of “Why Phoenixville?” The answers(s) to that question are important to the other river towns, because Phoenixville clearly offers a much better template for revival and reinvention than does Conshohocken, despite the latter's hugely larger financial numbers. I strive to expedite communication among the towns and their activists on the subjects about which I write; I do not claim to have any answers myself. I have asked for contributors to answer the question “Why Phoenixville,” and I am pleased to publish the first response I have received. It was written by Shannon Mannon, Chief Empowerment Officer of Activate Phoenixville Area (info@activatephoenixvillearea.org). I take no stand about its contents, but if I published it you can bet I think it is something worth thinking about. It is truly a “love letter,” as its title says, and I would like to hear from you about what she has to say and what you think of it. As a child, I had dreamed of living in a true community, where folks watched out for each other, where everyone knew your name. The dream was full-blown, bunting on the front porch, lemonade stand on the corner, romanticism. A throwback to another era. I tried not to let myself feel the dream too intensely, so that I wouldn’t be disappointed with the reality that places like that just don’t exist anymore. While the dream lay dormant, my newlywed husband and I were drawn to Phoenixville as proud first time homeowners in 2003. This was an era, most decidedly, “pre- renaissance.” But the bones were all there – a walkable downtown, a diverse population, an intimate small town feel in close proximity to Philadelphia and the bigger suburbs. More than anything, there was this palpable hope, this energy that seeped from the pores of the sidewalks, from the quirky folk I’d pass walking the tree-lined streets, to the historic buildings on Bridge Street themselves. Still, it was a leap of faith. We knew no one here, and had no idea what beauty we were about to uncover. After our first year as residents, there was no doubt in my mind that the community I jokingly dubbed to my out of town friends as “little Manhattan,” would one day rise into its full potential. You could feel the forward momentum. In those pre “First Friday” days, the Bridge Street sidewalks were empty on weekends. My pug and I would trail any other twenty-something we spotted because they were so rare a sight in the borough. It took experiencing our first Dogwood Parade to crack open the vault, shining rays of light on my sleeping childhood dream. Whoa Nelly! Was THIS ACTUALLY that kind of town? Be still my heart! Watching that sweet parade, that lil’ slice of Americana, stream past my front stoop, and realizing that communities like this DID exist? The dream was alive. For all of the parade’s eccentricities and length, what stood out was that folks came together to put this on because they cared. They shared a belief that neighbors are worth showing up for, kids get raised best when the whole village looks out for them, and that carrying on a tradition, no matter how much times have changed, is worth doing. Something shifted in me that afternoon. And I made a commitment to myself that I would raise the children I one day hoped to have right here. My initial enthusiasm made room for deep grooves to form. Inside those heartfelt hollows was our community’s shared sense of interconnection. What happens to one of us, impacts us all. This is the spirit that is next to impossible to quantify in words. Ask anyone who has been lucky enough to live here “what IS Phoenixville?” and they stare off, thoughtfully struggling to sum it up. Volunteerism? Generosity? Compassion? Caring? Love itself? We all feel it, sense it and live it. 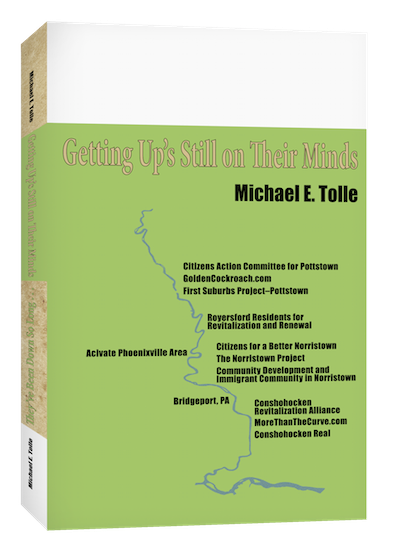 As a new Phoenixville transplant, what I hadn’t yet learned, was the community underground of leaders who had been working for decades to poise our community for the explosion in growth / engagement we benefit from today. I began to integrate myself into the community, to understand the social fabric that was clearly so rich. I struggled to figure out my place – knowing that I’d only get out of Phoenixville what I was willing to put in. How could I best serve and connect in to this community? I joined a church in the Borough, attended every community event I could find, volunteered, and became a frequent flyer at the Library, the Colonial, and the YMCA. And finally I made friends the old fashioned way – by pushing my sleep-detesting baby girl through the borough streets for hours a week chatting up folks. But still, I didn’t really feel like I was inside the community yet – more just a cheerleader from the outside. I sensed there was a bigger story at play, and like a detective, I hunted away until I could find a way in. The key clue was discovering, in 2006, the opportunity to be a Girls on the Run (GOTR) coach at East Pikeland Elementary, after reading about it in “The Phoenix.” (Cause what self-respecting ‘vill-ain didn’t read that cover to cover)? Suffice it to say that program knocked my socks off, and books will be written documenting the impact it brings to communities and to women of all ages. What was special for me, was that my GOTR coaching gig lead me to the community wellness coalition that brought GOTR to Phoenixville, Activate Phoenixville Area (APA). I joined APA in 2007. This position gave me a privileged seat to understand, and impact, the very fabric of this place. I learned that the profits from the sale of Phoenixville Hospital were used to start up the Phoenixville Community Health Foundation, whose mission is to improve the health and quality of life in the greater Phoenixville region by increasing access to health care services and promoting healthy communities. Aha! So this is why we have a depth and breadth of community organizations, and what feels like the most non profits per capita in the US! In Phoenixville, like most places, you can’t get anywhere without relationships. Over the years, APA has formed intimate partnerships that let us glimpse the stunning, selfless service that this community is built upon. Our knowledge grew deeper this year, as we joyfully conducted stakeholder interviews with the leading community wellness experts to better determine how Activate Phoenixville Area can be Phoenixville’s wellness hub. We heard stories about PACS facing “N.I.M.B.Y.” challenges in all their former locations. But in Phoenixville, were not only welcomed with open arms, but were given a key location in the heart of town to facilitate the ease of getting food and supplies to our most vulnerable populations. We learned more about Elizabeth Andersen’s crusade to get Phoenixville our first Farmer’s Market to open up access to fresh food. We celebrated connections that were made at the Activate table that enabled our brightest servant leaders like Michelle Ferretti at the YMCA, to engage hundreds of people and get thousands of pounds of fresh produce in the hands of the hungry through new community gardens! With great humility, we learned about the founding parents of Phoenixville, who stuck around after the mill closed, jobs were lost, and decades of pain, and darkness ensued. How these visionaries lit a flame of hope, and fanned it with their belief that this Phoenix would rise again from the ashes. Painstaking project by project, committee meeting by committee meeting, these heroes built up the foundation our community to poise it to rise greater than before. Because this time, our “vortex” is built on love. Activate Phoenixville Area is a partnership forged to empower & inspire wellness and wholeness in our community. We are golden thread that weaves together the organizations, people, and institutions of our community. We gather and shares these stories of hope. Join us. Use the hashtag #PhoenixvilleInspired on social media to share what moves you. Together, we will show the world -- Phoenixville IS the most inspired community.